Baseball's First Player To Take Paternity Leave Faces Criticism : The Two-Way The Texas Rangers' Colby Lewis became the first player in Major League Baseball history to take paternity leave but the milestone was met with some criticism. Texas Rangers pitcher Colby Lewis makes his return from paternity leave on Tuesday. He, and the Rangers, lost that night to the Los Angeles Angels of Anaheim, 15-4. Texas Rangers pitcher Colby Lewis became the first Major League Baseball player to go on paternity leave last week. The league codified the leave, this season, and now gives players 24 to 72 hours off for the birth of their children. Rob Neyer, national baseball editor for Sports Blog Nation, told Robert Siegel for today's edition of All Things Considered, that players have traditionally taken time off in the past, but now they don't have to ask permission. The league made the decision to make the change, he said, "basically to take the decision out of the hands of the team." But Lewis' leave hasn't come without some criticism. In Game 2, Colby Lewis is scheduled to start after missing his last regular turn in the rotation because — I'm not making this up — his wife, Jenny, was giving birth in California. To the couple's second child. Don't have kids of my own but I raised a step-son for eight years. I know all about sacrifice and love and how great children are. But a pitcher missing one of maybe 30 starts? And it's all kosher because of Major League Baseball's new paternity leave rule? Baseball players are paid millions to play baseball. If that means "scheduling" births so they occur in the off-season, then so be it. Of the 365 days in a year, starting pitchers "work" maybe 40 of them, counting spring training and playoffs. Neyer cautiously took Whitt's side in his interview with Robert. "I think [Whitt] took the argument too far," he said. "The example I gave was, what if it's game seven of the World Series? If you're a fan of that team do you want your pitcher pitching in that game? The Rangers last year made to the World Series. 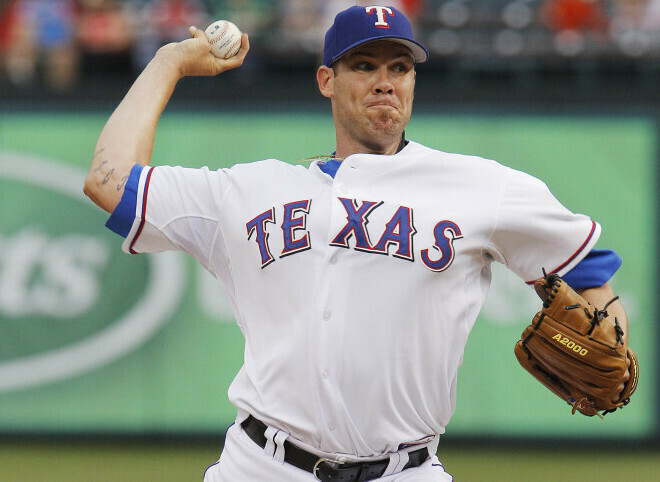 Colby Lewis was a big reason for that." But right now, Robert pointed out, it's only April. Tune in to your local NPR member station to listen to the full interview. We'll post the as-aired version of it here a little later on.